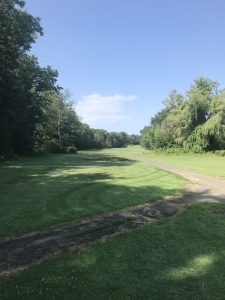 Despite the spring rains and the summer heat, Superintendent CJ Gallup and his staff have done an excellent job maintaining the golf course. The greens are rolling beautifully and the rest of the golf course is in wonderful shape. When you factor in these conditions and affordable pricing, it really is a great value to play here. 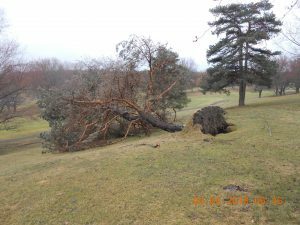 The staff will also continue to limb up trees that are in play on the golf course as the season progresses. 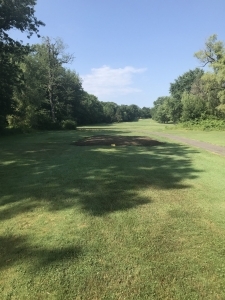 Some very exciting news is that the staff has started work on a new teeing ground between the front and middle tee on 8-Red. We have added some pictures below of the initial topsoil that was put down a few weeks ago. 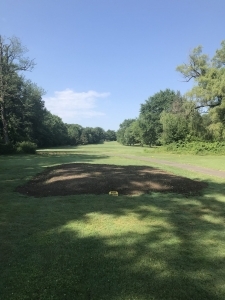 After some settling has occurred, the tee will then be sodded and seeded. Stay tuned for more updates. 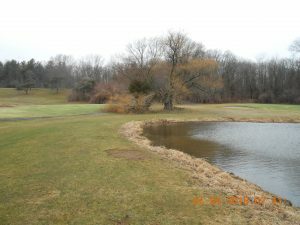 As we await the beginning of the golf season, it’s a great time to update everyone on the condition of the golf course. Overall, the course is in great shape for early spring. Our late fall fungicide applications have held up well under significant disease pressure. The greens look good and are showing slow but positive signs of recovery from mid-winter desiccation. We are very saturated right now but are looking forward to improving conditions as the grass responds to increasing soil temperatures. 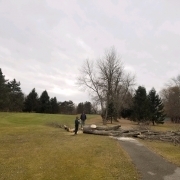 There is considerable tree damage and lots to clean up to be ready for play. 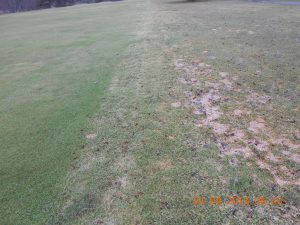 As you can see, the photos show fungicide efficacy and some of the tree damage. 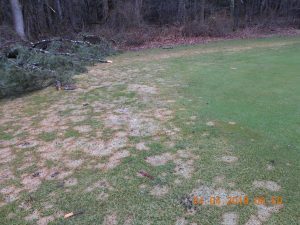 Photo 4 shows tree damage and pink snow mold with lesions beginning to coalesce just off the treated tee surface on right. Even though the golf season is shorter than everyone wants it to be, a golf course superintendents job is never done. It is 365/24/7 for CJ and his employees. 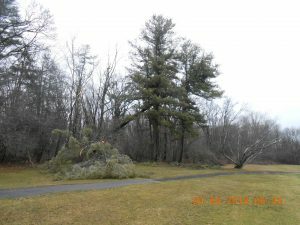 Here are a few pictures taken at the end of January to illustrate this fact. 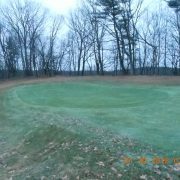 The golf course actually needs some snow coverage this time of year to protect the greens from wind damage. While most of the greens are clear of snow and ice and all of our greens are clean of disease, the first two pictures show the difference in the greens from the harsh winter winds. The last picture shows some ice and snow coverage.